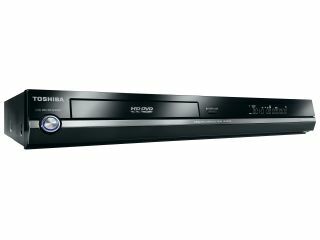 Toshiba is beefing up its range of HD DVD players with a third new model, it's been revealed today. The HD-EP10 joins the existing HD-E1 and HD-XE1 models and delivers 1080p full HD output, something the current HD-E1 model does not. Toshiba says the HD-EP10 will be the most competitively priced 1080p capable HD disc player available in Europe and that's certainly true - Panasonic's 1080p DMP-BD10 Blu-ray player, for example, costs £1,400 retail, but can be picked up online for around a grand. That's still more than double what the EP-10 costs. Attractive as it is, the low price of Toshiba's player may not be enough in the long term. Sony has already announced that it plans to launch a budget Blu-ray player , and there's plenty of evidence to suggest that Blu-ray discs are already outselling their HD DVD counterparts 3:1 in the US - a pattern that could be repeated here. Blu-ray adoption will certainly be spurred by the launch of the Sony PlayStation 3 in Europe next week, which will sell for £425. The PS3 includes a 1080p output and can do more than just play movie discs, making it a very attractive alternative to the Toshiba HD DVD player. HD DVD is also struggling to attract much interest from Hollywood or consumer electronics companies. Only two out of the seven big Hollywood studios (Universal and Warner) are currently planning to release movies in the format; while Toshiba can only count big CE brands like Sanyo, Canon, Onkyo and Fujifilm among its 60 friends. Things are slightly different on the PC side with the heavy-hitting muscle of Microsoft and HP on HD DVD's side, but even they maybe outgunned by the Blu-ray camp. Blu-ray's supporters include Sun, Sony, Philips, Apple, Dell, LG, Panasonic, Pioneer, Samsung and Sharp. And it's backed by Hollywood with Sony, Walt Disney, 20th Century Fox, Paramount and Warners (again). Canon is another bi-partisan supporter.